We were delighted that at the start of the day we received the 1,000th view of our "Best Pies in London Restaurants" article, which is currently our third most viewed article of all time! With the thoughts of 2,580 kcal of nothing but sweet apple pie still on his mind following Tuesday's exploits, Pierateer RAS decided to stick to the meat pies on Thursday. Having eaten the Fuud Chicken Pie Category winner on Monday night, Pierateer RAS consumed the two other Fuud pies that they had provided for lunch. Starting with the Steak, Kidney and Mushroom pie, this was a delicious filling, with the contents correctly leaning towards the steak but the kidney and mushroom in a thick gravy adding a nice balance to proceedings. The other pie seemed a more experimental flavour, with a Pork, Plum and Celery pie. While I have no doubt that meat and sweet can work together in some settings for certain people (such as your pork and apple sauce), I’m afraid this combination of pork and plum just didn’t really do it for me. Perhaps if you are a big fan of pork and apple this mix would suit your pallet, but the pork flavour was completely swamped by the sweet plum sauce. The pork itself seemed nice and tender but you couldn’t avoid the sweet sauce, which didn’t really mix well with the pastry. Fair play for trying something new but this pie didn’t really work for me. I mentioned yesterday that I am volunteering at the Yonex All England Badminton Championships and had eaten the Chicken and Leek Pie. 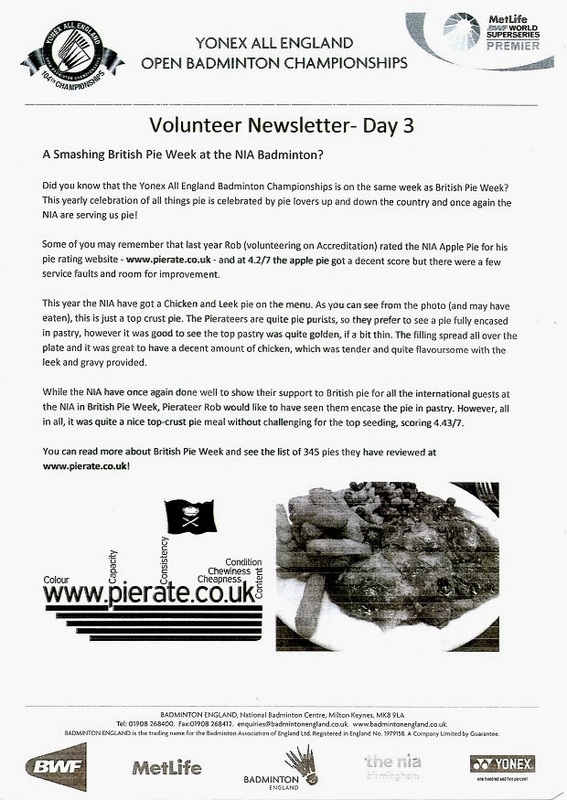 Having written the review, I also managed to get a summary of the full review included on the front page of the Badminton Volunteers daily newsletter (which I had also managed to do last year with the Apple Pie I rated back then).